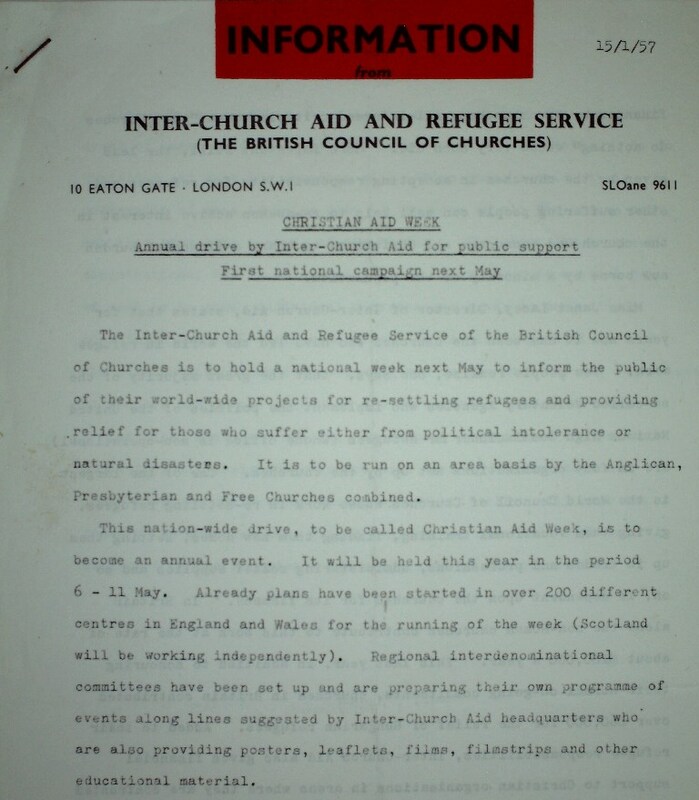 To coincide with Christian Aid Week – taking place this year between the 11th and 17th May – we highlight today some of the fascinating sources in the archive of Christian Aid which document the origins of the event. The archive, containing the historical records of the charity, is available here at Archives & Special Collections, SOAS Library. Christian Aid Week is the annual fundraising drive, which sees millions of famous red collection envelopes distributed to households across Britain and Ireland. The aim is to raise money for the nongovernmental organisation’s partnership work with communities in the Global South, which focuses on helping those affected by humanitarian disasters, tackling poverty through community-led development and campaigning on specific advocacy issues. Held every year since 1957, it is the longest continuously running fundraising campaign in Britain, and last year local fundraising events and collections by volunteers raised almost £12,000,000 for Christian Aid’s work. 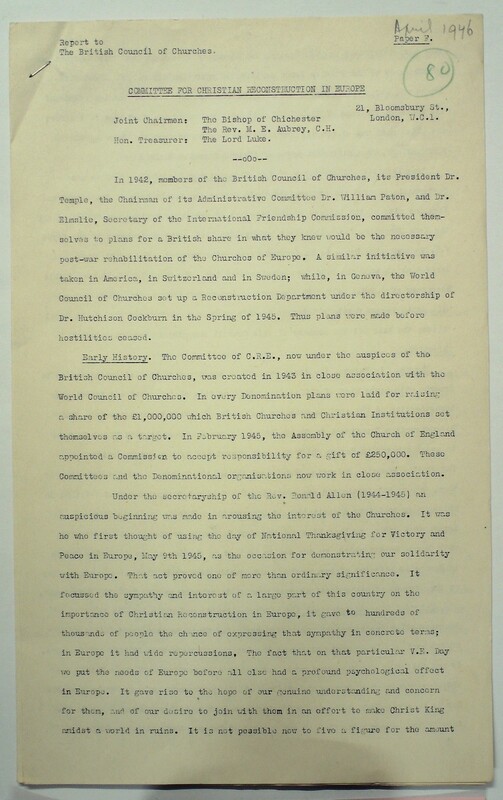 Christian Reconstruction in Europe report, 1946, concerning the national appeal on V.E. Day, authored by E. Iredale. ICA archive. © Christian Aid. Christian Aid’s early origins lie in the organisation Christian Reconstruction in Europe (CRE), an ad-hoc committee founded in 1943 by the major British and Irish churches involved in the British Council of Churches (BCC). The organisation aimed to raise funds for the spiritual well-being, relief and resettlement of some of the millions of people in Europe left homeless and destitute by the Second World War. Due to the success of the fundraising event, CRE repeated its national appeal to the public – now renamed ‘Churches in Europe Day’ – on the first anniversary of V. E. thanksgiving Sunday in May 1946. In 1949, Christian Reconstruction in Europe was brought together with the ‘Ecumenical Refugee Committee’ of the British Council of Churches – responsible for producing a series of reports on the refugee situation in Europe – to establish a new permanent department at the BCC. The stated objective of this new body, the ‘Inter-Church Aid and Refugee Service’, was to ‘provide succour to churches, church institutions, and individuals overseas or from overseas, who are in want’. The new Board of Directors of the Inter-Church Aid were given wide-ranging operational and financial autonomy from the BCC. The Inter-Church Aid and Refugee Service continued much of the work initiated by CRE. The organisation continued to raise funds in Britain through church networks and these were sent via the World Council of Churches in Geneva to aid refugees in Germany, Austria, Italy and Greece. However, Inter-Church Aid also broadened its focus, collecting for humanitarian crises experienced beyond the predominantly Christian communities of Europe, in particular meeting the pressing needs of Palestinian refugees across the Middle East and communities displaced by Partition in India and Pakistan. In 1952, Janet Lacey, who had previously worked for the BCC Youth Department, was appointed as the organisation’s new Director; and during that decade Inter-Church Aid continued to expand its remit to include not only international humanitarian and disaster relief but increasingly the provision of aid to churches and other partners working in newly decolonised countries of Asia and Africa, who were undertaking longer-term projects combatting poverty and social conflicts. Due to the increasing need for relief aid in the mid-1950s – including for refugee crises in Korea, Hong Kong, and Hungary – under Lacy’s leadership, Inter-Church Aid began planning a new ‘national appeal’ to provide a focus for fundraising and encourage public awareness about the organisation’s work. In an early set of recommendations to Inter-Church Aid in 1956 ( ‘Projected National Appeal – Notes and Recommendations’, authored by M. Rickards, 1956. 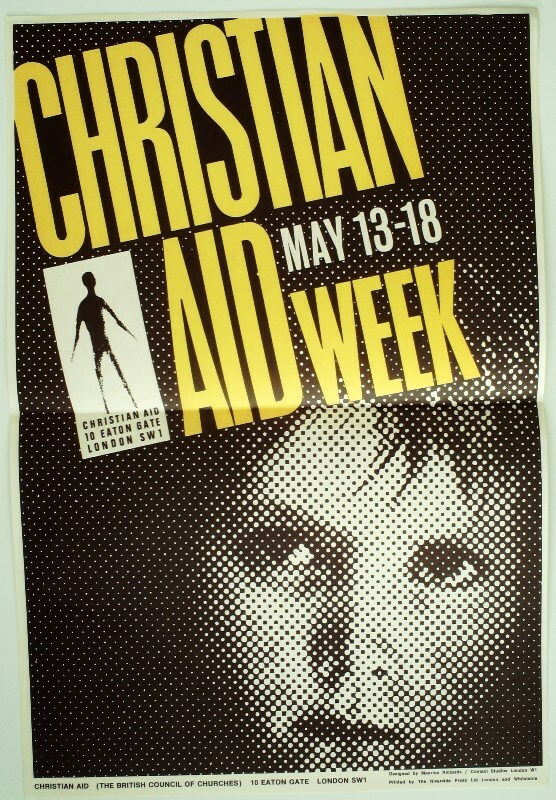 Christian Aid archive, CA/I/2. (c) Christian Aid), the artist and activist Maurice Rickards proposed the new campaign, unlike previous events, must broaden its constituency beyond existing sympathisers within the churches. Rickards claimed that if it was held annually during the same week every year the national appeal could ‘achieve the status, sympathy and currency of SAVE THE CHILDREN or RED CROSS’. The name was subsequently adopted and the first ever Christian Aid Week took place between the 6th and 12thMay 1957. To organise the national appeal, officers at Inter-Church Aid established regional interdenominational councils made up of volunteers who oversaw fundraising in localities. Organisations such as the BBC and the United Nations Association provided support and publicity for the week. Events around the country included services, lectures, rallies, films and exhibitions on the plight of refugees and the work of Inter-Church Aid, all leading up to a week of ‘flag days’ (involving volunteers collecting money in exchange for flags) and house-to-house collections. In total, the appeal mobilised residents in two hundred towns and villages across Britain, collecting over £26,000 for international relief work. By 1964 the now annual week of fundraising in May had become so successful and so well known that the Inter-Church Aid and Refugee Service itself was renamed ‘Christian Aid’ – a name the organisation retains today. Christian Aid Week has been held every year since that first campaign in 1957. By the end of the 1960s, the fund was collecting over £1,000,000 per year. The funds raised during the week have helped Christian Aid through its international partners to provide humanitarian aid to communities suffering disasters, such as famine in East Pakistan [Bangladesh] and Sudan in the 1970s and Ethiopia in the 1980s, and political crises in Rwanda and the former Yugoslavia in the 1990s. Christian Aid has used funds to support a growing number of locally-led development and community empowerment projects across the Global South. Today, the organisation funds over seven hundred local organisations in more than seventy countries. Since the 1960s the organisation has increasingly challenged what it views as the deeper structural, economic and social root causes of poverty and social injustice and not just dealing with their symptoms. For example, the nongovernmental organisation took a strong stance against Apartheid in South Africa in the 1980s and more recently has campaigned for the cancelation of the debt of developing countries and promoted international Fair Trade. The Christian Aid archive (along with that of its predecessors Christian Reconstruction in Europe and the Inter-church Aid and Refugee Service) is made available to the public here at Archives & Special Collections, SOAS Library. The Christian Aid archive is a unique and significant primary source which documents the history of an internationally important charity and development NGO. It currently covers the period 1946 to the early 1990s and includes correspondence, committee minutes, policy documents, internal reports, field notes, surveys and campaign material. 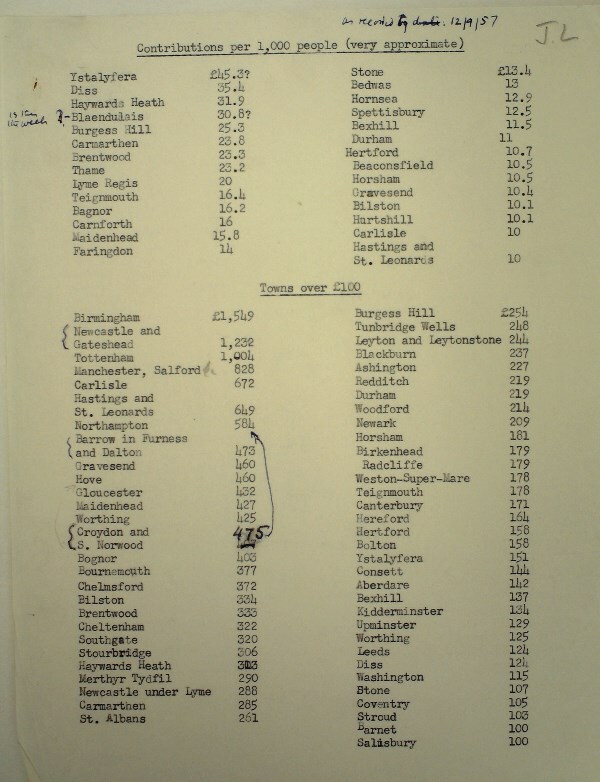 Amongst other issues, these records document changing approaches to aid and development over the twentieth century; they provide valuable sources for the study of both the political, social and economic situations faced by Christian Aid’s partner communities in the Global South, as well as the history of grass-roots voluntary action and social justice campaigning in British society. The collection holds obvious value to students and researchers in the fields of development studies, history and politics, but it will also be of significant interest to researchers across disciplinary boundaries seeking to analyse and understand the pressing issues which confront communities and social movements in the Global South, including poverty, development, religion, health, the environment, food security, equality and human rights; as well as for those considering inequalities in social and political relations in the present globalised economic system.